The 2011 Ford Mustang puts 305 high-performance horses in the hands of V-6 coupe buyers with a new all-aluminum dual-overhead cam (DOHC) engine that delivers a projected 30 mpg on the highway with a six-speed automatic transmission and fun for drivers on nearly every road. While Mustang’s aerodynamic improvements were designed mainly to improve fuel economy, engineers also adjusted the vehicle’s front/rear lift balance. The result is a car that tracks more securely and feels more “planted” to the road surface at higher speeds, helping to keep the tires in better contact with the pavement. For years, Microsoft founder and former CEO Bill Gates was the keynoter at the Consumer Electronics Show. 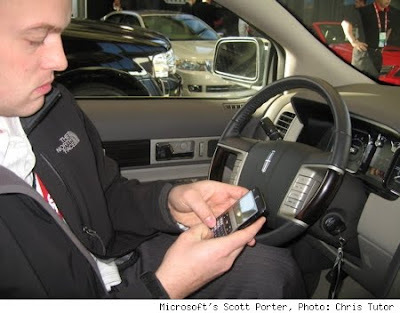 When Microsoft first announced its intention to create software for cars nearly a decade ago, most people that had suffered through the indignities of the blue screen of death recoiled in horror. The idea of having to close all of our car windows and re-booting our cars became a running joke. While Microsoft's automotive in-roads probably didn't get as far as the company hoped, it does have one prominent application: Sync, one of the most popular options in Ford vehicles in recent years. With Gates' retirement, Ford CEO Alan Mullaly will be taking on the big keynote in Vegas next January and the Consumer Electronics Association (CES) will honor the automaker for its efforts in developing Sync and the Work Solutions package for its trucks. Ford has continued to expand the functionality of Sync recently adding traffic, directions and general information, as well integrating with Bluetooth phones to automatically call 911 in an emergency. The show organizers have also named the new Taurus as the official car of the 2010 show. Ford SYNC's latest application – Traffic, Directions & Information – leverages industry-leading voice-recognition software, integrated GPS technology and a customer's Bluetooth-capable mobile phone. It provides simple hands-free access to personalized traffic reports, precise turn-by-turn driving directions and up-to-date information including business listings, news, sports and weather. These new capabilities are in addition to SYNC's established hallmark suite of services, from hands-free, voice-activated cell phone and digital media player integration to the more recent security and convenience additions of 911 Assist™ and Vehicle Health Report. Introduced in 2007, more than 80 percent of the vehicles Ford sells in North America are equipped with SYNC, and more than 1 million SYNC-equipped vehicles are on the road today.